Maria Mercedes star Jessy Mendiola is in Seoul. Today, October 31st, a special ceremony was held for her as she is appointed an Honorary Ambassador for Korea Tourism. Oh I love Jessy Mendiola and I’ve been watching her newest teleserye, Maria Mercedes. It is an adaptation of the popular Mexican telenovela starred in by Thalia! This is not Jessy Mendiola’s first trip to Korea. Last year, she visited Korea in November as she was one of the guests on the KBS World program on “World Date with SHINee”. She spent time and had an interview with SHINee along with other girls from other countries. 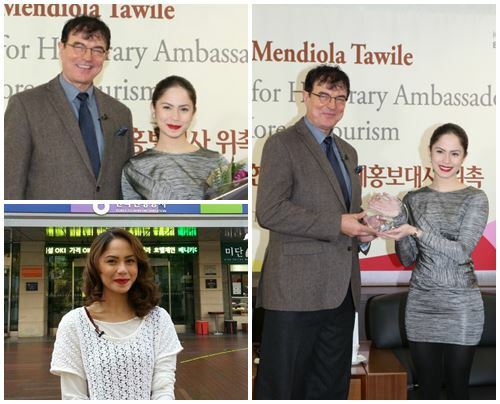 In the ceremony on October 31st, Jessy Mendiola was represented with a plaque by the head of the Korea Tourism Organization or KTO, Mr. Charm Lee. Yay for another Pinay achievement! yes xa un hehe ! !